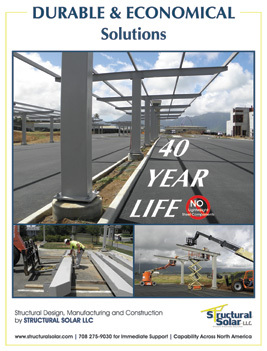 Structural Solar LLC is a leading design-build company who specializes in durable, functional and economical solar canopies for institutional, municipal and commercial solar installations. The company designs and installs snow and ice rails of its solar canopies as may be required by the owners of such systems. In fact, Structural Solar is a leading provider of “module-ready” solar structures to solar developers doing mid to large solar installations at commercial and institutional structures around the country including in the snow-belt. Solar canopies or solar carports are an attractive alternative to rooftop solar installations, particularly for highly visible institutional and commercial installations. Solar canopies and particularly canopies in parking lots can be favorably oriented and sized to accommodate large commercial and utility scale solar arrays but a key consideration is snow and ice removal from around and underneath the solar canopies. Snow and ice rails for solar canopies are the subject of a product bulletin available for review from the company’s website. It addresses the considerations regarding snow and ice, including the options for adding an ice rail at the lower eave to prevent shedding snow or ice. If designed and installed properly, Solar Canopies provide 20 to 25 years of no or low maintenance service as solar structures. They are “green” structures in that they not only elevated solar supports but provide shade to parking lots which are otherwise heat sinks during the summer. Solar canopies or equivalently solar carports generally do not have a roof system under the solar panels. The solar modules act as the roof but by design, they are not intended to be waterproof and instead allow water and dappled sunlight to harmlessly pass through. In this respect, solar canopies do not materially impact the permeability or rain run-off of parking lots. And there are other benefits as well. The structures qualify as part of the Investment Tax Credit and the open roof area allows modules to operate more efficiently at lower temperature during the summer. But for solar installation within the snow-belt, there is concern among owners about the potential for shedding snow. The standard clearance for most parking canopies including solar canopies is 8’-6”. This allows ample clearance for most all vehicles while still providing some protection from the elements, namely snow, sun and rain. Solar canopies are typically tilted at about 5 degrees toward a southern azimuth so the upper eave is considerably higher, often over 12’ or 13’. During a heavy snow, it is not unusual to see less snow build-up on the canopies relative to the ground. As an elevated structure, wind will naturally swirl around the roof and drifting / accumulation is less likely to occur.